I keep telling folks, “Learn new stuff” and “then blog about it!” I figured it’s time I take my own advice. 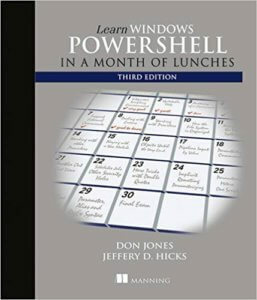 I’m reading Learn Windows PowerShell in a Month of Lunches by Don Jones (@concentrateddon). I’m actually reading the first edition. I bought the book a while back and I’m just now reading it. Why? I got shamed on Twitter for using Azure CLI. It’s for the best, I promise. I’ve been needing to learn PowerShell. And Hadoop. And Machine Learning (I’ve been helping my Data Driven co-host, Frank La Vigne [@Tableteer] some by tech-editing his Artificially Intelligent column in MSDN Magazine). 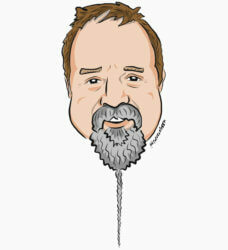 In the first lesson / lunch, Don shares how to use PSDrives. PSDrives allow you to do some very cool things in PowerShell – like connect to the registry and navigate it as you would the file system. 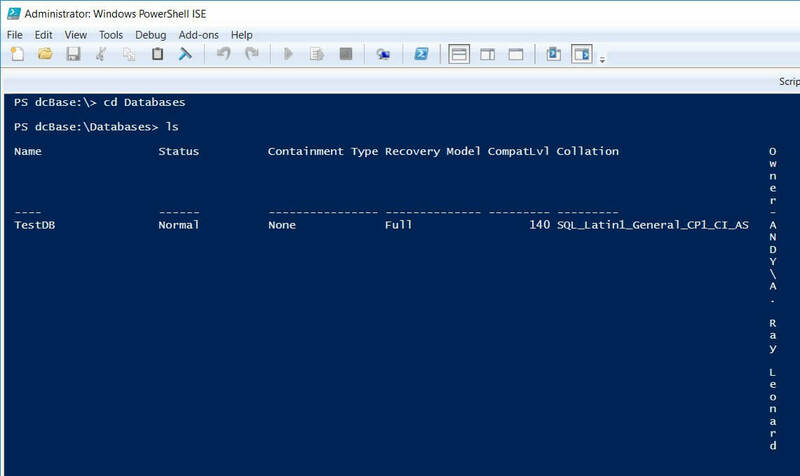 In this section, Don mentions you can connect to SQL Server and navigate the contents of an instance in a similar fashion. I had to figure this out! New-PSDrive : Cannot find a provider with the name ‘SqlServer’. I searched for an answer and had difficult time locating what I was doing wrong. One key to learning is making the problem give up before you do. After an inordinate amount of time, I discovered I’d not loaded the sqlps module. Now, if you’ve been using PowerShell for a while, you already have your environment configured to automagically load sqlps. If you’re a n00b, though, you may not. And I am a n00b. Also, for people I’ve encouraged to start blogging: Here’s a topic. Right here. I picked up a book on a topic I know nothing about, starting reading, tried something on a tangent, made the problem give up before I did, and BAM! Instant topic. Even though I’m no Mike Fal (@Mike_Fal), Chrissy LeMaire (@cl), Rob Sewell (@sqldbawithbeard), or Aaron Nelson (@sqlvariant), I ran this one down and figured it out. Once I enter my credentials and click OK, it works! Now I won’t ever have to figure that out again. 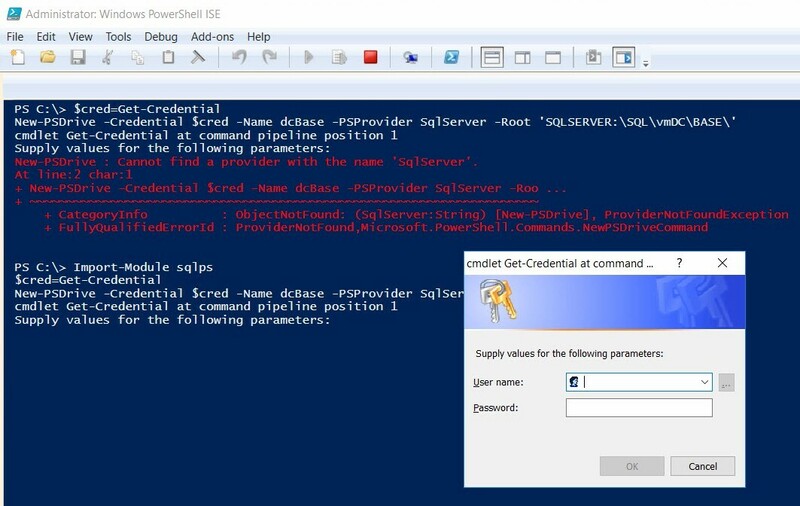 In experimenting, I also learned that when connecting to local instances – that is, instances of SQL Server on the same server I’m running PowerShell – supplying credentials is unnecessary – at least when I am system administrator and a sysadmin on the SQL Server instance. I next attempted to connect to my newly-mapped PSDrive and experienced another n00b moment. My command? cd : Cannot find path ‘C:\dcBase’ because it does not exist. This really isn’t the conclusion – I’m just getting started! You do not have to be an expert in technology to blog about it. I am definitely not a PowerShell expert, and yet here I am, blogging about it. 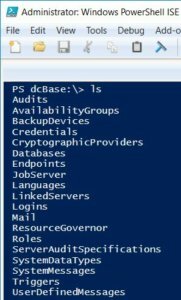 You see one way to create a PSDrive for a SQL Server instance and connect to it, along with a couple ways to not do those things. That’s awesome Andy. Really glad you are learning PowerShell. It would serve you better to install the sqlserver module as is the new one. Install-Module sqlserver -scope CurrentUser will do it. I’m learning the wonders of Powershell as well. For the SQL Server DBA, I strongly recommend the dbatools module (https://dbatools.io/). Running some of these commands has been a fantastic learning experience.